(NEWS CENTER) - 35 years ago Joyce McLain's body was found behind the soccer fields at Schenck High School in East Millinocket. She had been brutally killed. A State Police Crime Scene Unit and two cruisers were seen leaving the area a little after 4 P.M. on Thursday evening. Joyce's mom Pam told NEWS CENTER that she was notified this morning by Maine State Police officials that their detectives and a crime scene van would be near the field where Joyce's body was found. 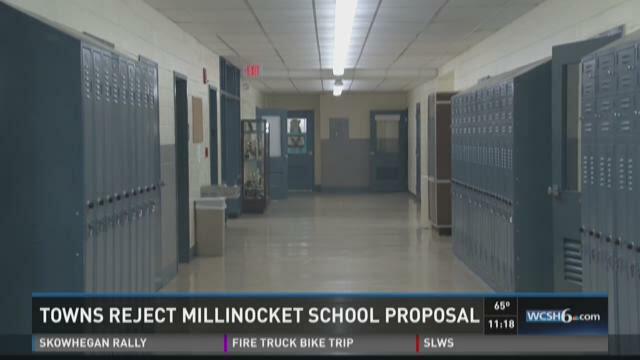 KATAHDIN REGION, Maine (NEWS CENTER) -- The latest proposal to send students from three Katahdin area towns to Millinocket has sparked controversy once again. MILLINOCKET, Maine (NEWS CENTER) -- The Millinocket Town Council has decided to put some money back into the town budget for the public library. The budget they took up late Thursday afternoon included more than $200,000 in cuts. The largest share of the proposed cuts, about $80,000 was the entire yearly budget for the public library. That money pays the staff and keeps the lights on for 15 hours each week. Members of the Friends of the Millinocket Memorial Library offered a compromise. They aksed the town to contribute $30,000 which they would need to match with $30,000. They've collected $20,000 so far. "To me it's the heart of the community. for me it's very emotional," explained Bernie Friel, a member of the Friends of Millinocket Memorial Library. MILLINOCKET, Maine (NEWS CENTER) -- Opponents of a national park in the Katahdin region have sent a letter to Roxanne Quimby and her son Lucas St. Clair urging them both to drop their plans for a park on land the Quimby family owns nearby. The plan is to put the park on land east of Baxter State Park. Seventy-five=thousand acres would be set aside for a national park and 75 thousand acres for a national recreation area that would allow hunting and snowmobiling. The Maine Woods Coalition said recent referendums in East Millinocket and Medway showed voters there overwhelmingly reject the idea. The Millinocket Town Council also opposes it. EAST MILLINOCKET, Maine (NEWS CENTER) -- A majority of East Millinocket voters casted their ballots against a controversial proposal to create a national park in the Katahdin region. On Monday, 320 voted against the park while 191 voted in favor. The town of Medway voted an overwhelming "no" in a similar vote last Tuesday. This non binding vote is for the board of selectmen to see where the community stands on the issue. The proposed plan would be to establish a 75,000 acre national park along with a 75,000 acre national recreation area. The recreation area would allow hunting and snowmobiling. Some proponents say that having a national park could create jobs, and increase tourism while some opponents say that they do not want to give up land to the federal government. So far, there has been a steady turnout. EAST MILLINOCKET, Maine (NEWS CENTER) -- Representatives on the both sides of the national park proposal are answering questions head-on about the proposal Thursday. Opponents gathered earlier in the day to discuss their concerns. They say a national park in the Katahdin area it will hurt jobs and limit recreational access. The park would make up 75,000 acres and another 75,000 acres would be a recreation area. Opponents are skeptical of the plan and think it is vague. They also said it would only bring in low-paying jobs that wouldn't boost the economy. They also fear that the land isn't attractive enough for a national park.